Sick dog symptoms are often subtle and happen to even the best cared for animals. So, since acquiring your pet, you've followed a regular health care program, including giving your dog veterinary recommended vaccinations and routine de-worming, combined with a balanced diet and plenty of exercise. This means you should never have to deal with a sick dog, right? Not necessarily. 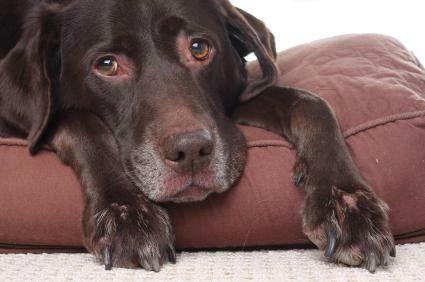 Even the most cared for canines will occasionally display symptoms of illness, and these signs can range from fairly mild to severe, depending on their cause. The question then becomes what to do when you notice your dog is under the weather? Sick dog symptoms are an outward sign of an inward disorder, be it an injury, infection, or disease. The key to deciding whether veterinary intervention is in order lies in recognizing the symptoms and having a general idea of their causes. The following table is only a general guideline and is not meant to replace a diagnosis from a qualified veterinarian. While there are possible causes listed for specific symptoms, this doesn't confirm your pet has a particular illness, and there may be other causes not listed for each specific symptom. Your vet will consider your dog's symptoms and perform any testing necessary to give you the most complete and accurate diagnosis. Sick dog symptoms increase or intensify over a 24 hour period. Symptoms persist more than a day. The animal in question is in obvious distress. In the long run, it's better to be safe than sorry, so if you believe your dog may truly be ill, don't hesitate to call your vet for advice and an appointment. After all, doesn't your dog deserve as much care as any other member of the family?.